The selfish Princess Spice has stole sweet Princess Sugar's crown and banished her to the dungeons of Cocoa Castle. 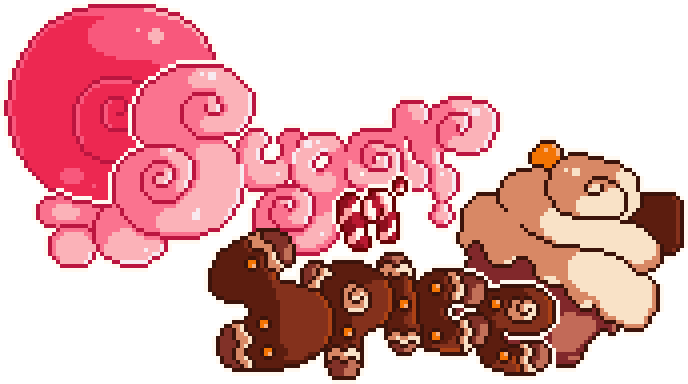 Help Sugar escape her prison, battle through the vile Cookie Creeps, traverse the chocolate coated wastes of Cookie Kingdom and return home to take back her throne! This project is currently in a seriously unfinished state. Not all features are in or functional. It is broken as hell. Hello! Have you got plans to finish this game in near future? Looks awesome! I wouldn't even call it a proof of concept. More "things I managed to figure out how to do in the time I've been learning game maker". I have moved this project from a basic Mario clone in Construct Classic, to an attempt at a more action-platformer in Construct to what it's becoming in Game Maker. So I basically have no idea what I am doing and am surprised it runs at all. But I made a promise to have something, anything, for demo day and here we are. The big brown thing is Miss Cake. Her shockwave was a last minute addition and I've learned that a stun would be better than damage. She'll have much more feedback when she's finished to hopefully assist there. I'm glad you at least thought it was graphically decent. I am more artist than programmer so it would be awfully depressing if even the graphics were terrible.